This was a smaller catalogue than the previous sale with 120 lots of medals and militaria in the sale. 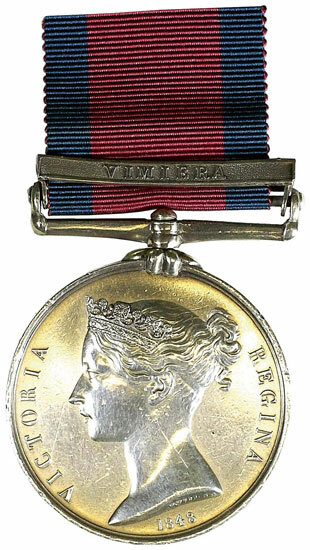 Lot 10 was a 1793-1814 MGSM with single Vimiera clasp to Robert Milligan of the 91st Foot who had been taken Prisoner of War by the French, and which easily beat the estimate of £800 selling for £1357 to a telephone bidder. WW1 was well represented as usual and Lot 24, a Military Medal and Bar group of 12 to Pte George Reid of 1/7th Bn Gordon Highlanders and later Royal Pioneer Corps sailed past the estimate selling for £1180. WW2 had a fair selection with the highlight being a Military Cross group to Major Frederick Thomas William Nixon Royal Engineers. He was twice Mentioned in Despatches and earned the MC for his actions in help bridge a river under heavy fire in Italy in April 1945. The group finally sold for £1475. 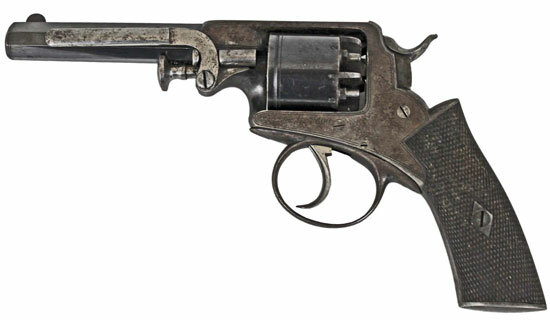 There was 44 lots of militaria including a good range of firearms and edged weapons and Lot 77, a 1850s Adams style 80 bore self-cocking revolver in fitted case sold to a commission bidder for £826. Lot 104 was an unusual Luftwaffe cloth pennant, which despite staining and a number of small holes sold for more than twice its estimate fetching £238.